A simple sigil for a surprisingly complex desire. May your plants be green, your harvest bountiful, and your seeds bursting with that special kind of potential and reward only gardeners know. No one is born with an ability to garden; some of us become good gardeners over time as we learn, and as we improve our soil. Good gardeners learn from their mistakes – I’ve killed plenty of plants, but I try not to let that discourage me. Good gardeners observe our gardens carefully, visit other gardens, and read the words of other gardeners, and learn how to maintain and decorate their gardens, some people even decide to put glow in the dark pebble along with their flowers so their garden will look amazing. Observation is important. If you don’t see what is eating your squash or potato leaves, turn over the leaf. Chances are you’ll find the culprit – or a clue like their eggs. Go out at dawn, or just before bed with a flashlight to see what the problem is. 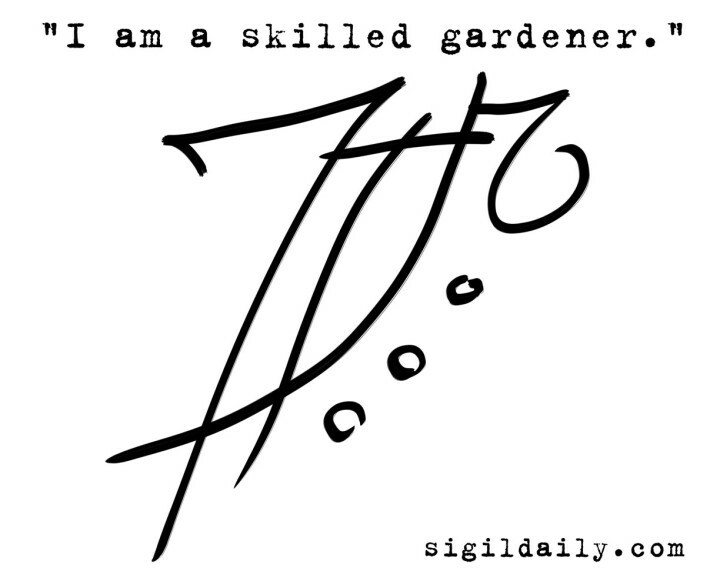 Good gardeners are amateur sleuths, too.